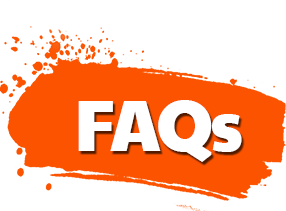 Some frequently asked questions from Mums, Dads, Grandparents and Kids are answered for you, right here on this page – helping you make the best choice when it comes time to decide which Aqua Action Waterslide best suits your lifestyle. How much weight can your waterslides handle? Aqua Action Slides are built with the whole family in mind. The ‘Wild Ride’ ‘G-Force’ and ‘X-Stream’ are all made to hold up to 113kg. So that means EVERYONE can have fun in the pool with their Aqua Action Slide! The Zoomerang Slide is made for younger children, or those who are limited on surrounding pool space – but it can still take up to 90kg. 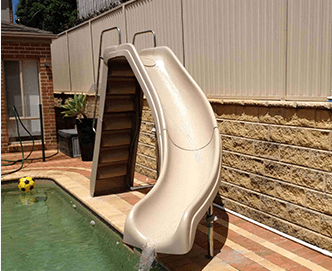 Aqua Action Slides are made from a strong acrylic material and treated with a UV protection coat to guard your Slide from the harsh Australian sun. Like any object that you leave outside all day, every day the Slide will fade, but only the slightest bit. Because the colour is incorporated into the acrylic material, the fading is much less obvious than an object that has been brushed over with actual paint or coating. How long will it take to arrive from the day I order my Slide? If you decide on adding a Wild Ride Waterslide to your pool, the average delivery time is within 1-5 days, anywhere in Australia. This is because the Wild Ride is our most popular slide and it’s kept in stock at our Parramatta warehouse in NSW. Our other slides such as the G-Force and X-Stream for example, have to be ordered in from America and in some cases can take up to 8 weeks, depending on Australian Customs. 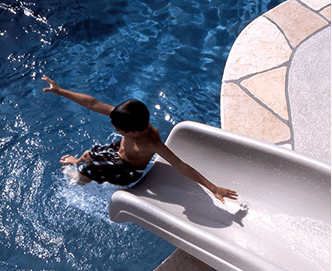 The Build Your Own Slide is specially made for YOUR unique backyard setting, so these have to be reviewed over by one of the helpful staff at Aqua Action, so that the design fits perfectly into your backyard. These slides are made on demand, so unfortunately we can’t give an estimated delivery time until the order has been placed. Where do the slides get their water from? YOUR job is to have fun on our water slides. 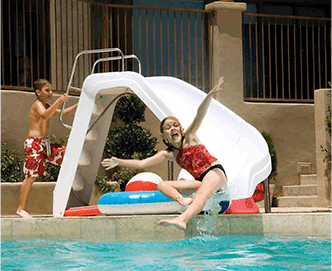 OUR job is to make sure our slides’ safety and durability features surpass those of all others on the market, without losing the edge on excitement and performance. Runways with a deep U-shaped ‘flume’ rather than the typical flat base or lower ‘L’ shaped sides. The flume helps contain kid and adult sliders more comfortably and safely throughout their ride and is better suited for larger framed people. Fully moulded steps and deep treads to prevent slip-throughs when using the ladder. Highly durable and corrosion-resistant slide support systems, installation systems and equipment. Our water slides are made with acrylic (rather than fibreglass) and come with UV protection, which means they last and last without fading – perfect to endure the Australian sun. When it comes to water flow, our slides feature a Zoom Flume™ water delivery system that gives sliders a turbo-charged water park-inspired ride right in their own backyard. The water is supplied by a generous sized 25mm diameter tube that creates a sheet of water across the flume for the slider to rocket down, hydroplane style. Our water delivery system shoots out a speedy rush of water flow to create a big splash. Buying Aqua Action means buying speed, safety and quality!